A vegetable patch has always been a romantic notion for us. The loveliness of brushing the dirt off vegetables, bushels of red apples, sunshine, blue skies and smiles…all of these things wrapped up and neatly deposited on our clean white plates. A few months ago, my dad constructed raised beds behind our family restaurant and carefully planted lettuce, radish, spinach and scallion seeds. He chose to use no pest control of any kind, chemical or holistic…just let the vegetables do what they do. We’ve been eagerly waiting for the day we could have garden fresh salads. Finally, fresh cut garden salad days have arrived! Armed with scissors and a bowl, we snip off the bright green leaves. And while we expected to wash the vegetables before eating them on our white plates, we didn’t expect how carefully we’d have to wash them. Of course, there are bugs on this food, it’s grown in dirt and nourished by nature. When I buy green stuff from the store, it’s so clean! How does it get so clean? And just because there are no crawly things on it, doesn’t mean there’s nothing on it. How, oh how, as a human have I become so disconnected from the thing that keeps me alive? Of course, we could concoct a pest control plan that doesn’t harm the environment. But that’s not really the point. The point is there’s so much to learn about eating from our backyard. 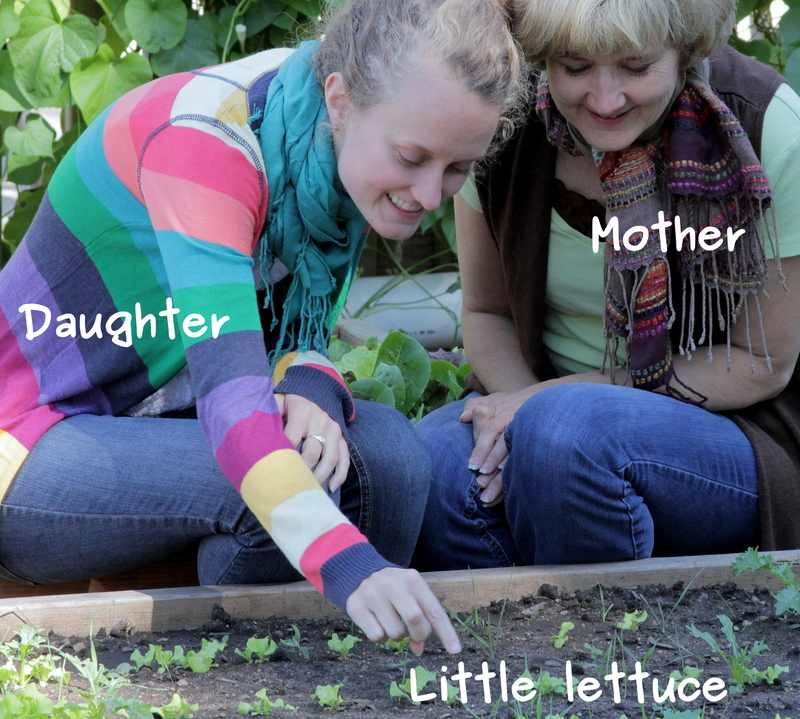 Lettuce washing and pondering has helped us decide to put on our thinking caps together–as a mother and daughter team–and learn about food…how do it locally, healthily, with some spice and with some adventure. This blog will be a place where we dig in and explore sustainability, recipes, restaurants and learn from the world around us. This is such a fascinating blog! Thank you so much for all the time and energy you’ve put into it thus far; I look forward to following your adventures! Just this past weekend I printed off some research about starting my own garden in the spring, and this has truly inspired me!